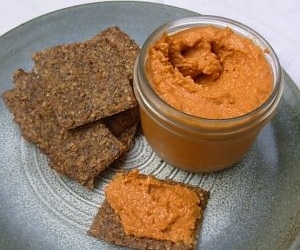 Korözött | Paprika Cheese Spread is a Hungarian food recipe from cottage and cream cheeses. Spoon the cottage cheese into a sieve. Place the sieve over a bowl with the same size rim. The liquid (called whey) will start to drip out of the cheese. Let the whey drain out while preparing all the other ingredients. Stir together the cream cheese, onion, sour cream, paprika, caraway seeds, and mustard. Using a wide spoon, press as much liquid as you can out of the cottage cheese. Add cottage cheese to cream cheese mixture, mixing well. Turn cheese spread into a bowl for serving. Cover bowl. Chill in the refrigerator for at least 1 hour so that the flavors blend. Sprinkle chives over cheese spread just before serving.